March 5, 2018 February 17, 2018 / Elizabeth T.
Happy March! Can you believe that winter is almost officially over, and it’ll be spring in less than a few weeks? I’m so excited for the start of warmer weather, pretty blooms, and longer days. What’re some of the things that you’re excited about this month? As with every month’s end, I’ve rounded up some of my favorites, and I can’t wait to share them with you! 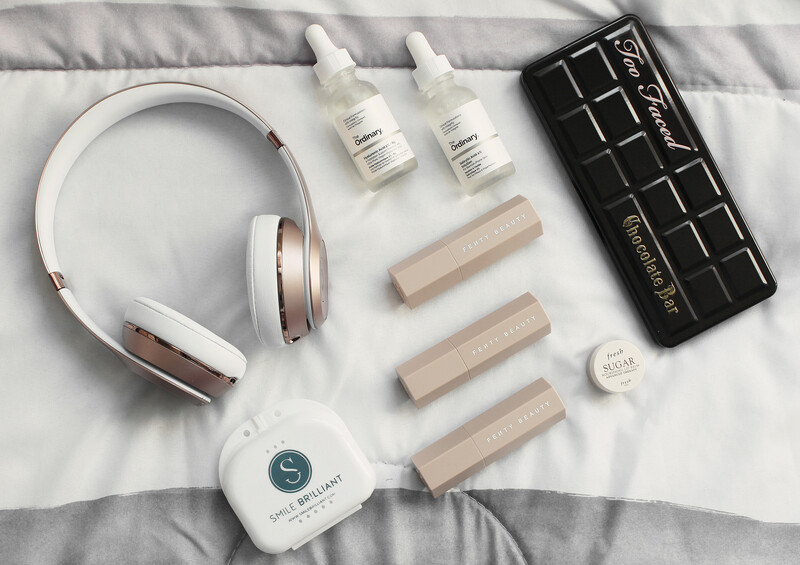 There were definitely some great products that I’ve tried this past February, and I think they’ll be perfect additions to your spring routine! So without further ado, let’s get started! 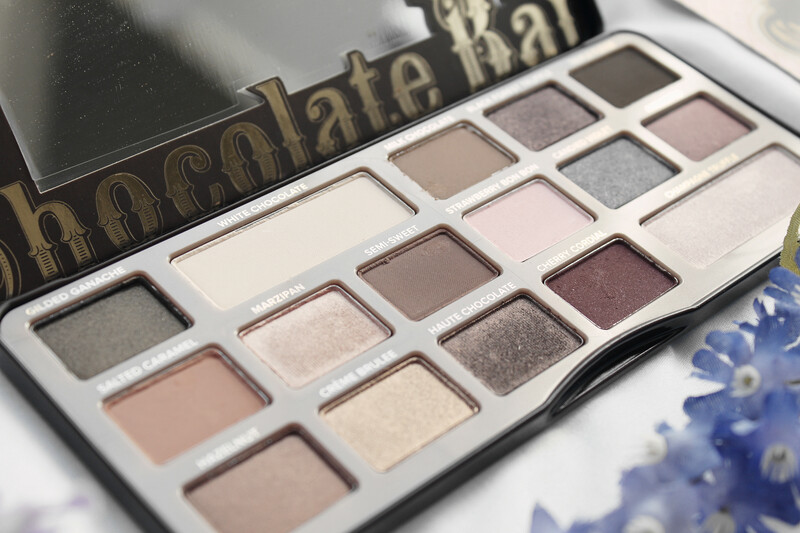 First up is this gorgeous eyeshadow palette from Too Faced, and it’s none other than their famous “Chocolate Bar!” I received this from Vicky from Vicky’s Scrapbook as my birthday gift back in January, and I haven’t been able to get enough of this palette! True to its name, this eyeshadow palette really smells so good, and is formulated using real cocoa powder and scented with real chocolate! I also love how the beautiful assortment of brown and neutral eyeshadows have chocolate-inspired names! Plus, the packaging is super cute, with a playful “chocolate bar” tin! My next favorite is another makeup find! 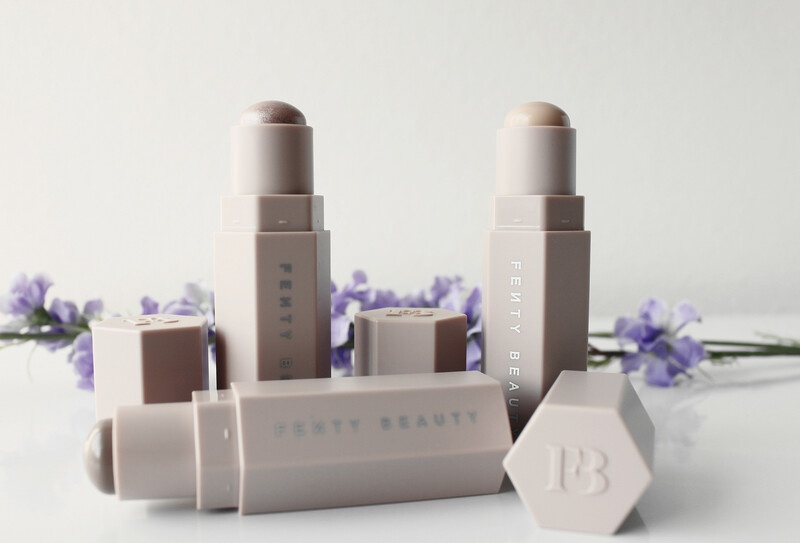 In my last monthly favorites, I mentioned that I’ve finally hopped on the Fenty Beauty bandwagon, and now that I started, I can’t seem to stop! Aside from the Fenty Beauty lip colors, I’ve also been obsessed with this magnetized trio of long-wear, light-as-air makeup sticks! I love how beautiful the packaging is, with its gorgeous light rose gold appearance, and the magnetized tubes that it comes in also makes it so compact and travel friendly! Apart from the packaging, the sticks’ formulas are actually so amazing and of such high-quality. I love how the set has three sticks, one for concealing, one for contouring, and for highlighting. The cream-to-powder formulas are so seamless and looks so natural. I love how they’re so buildable and can be used for both light to medium wear! Out of the Fenty Beauty products that I’ve tried so far, I’m definitely very satisfied and can’t wait to try even more! Other than the amazing makeup finds this past February, I’ve also discovered some new skincare brands as well! I’ve heard a lot of hype about The Ordinary lately, and I was super excited when Sephora announced that they would now be carrying the brand! 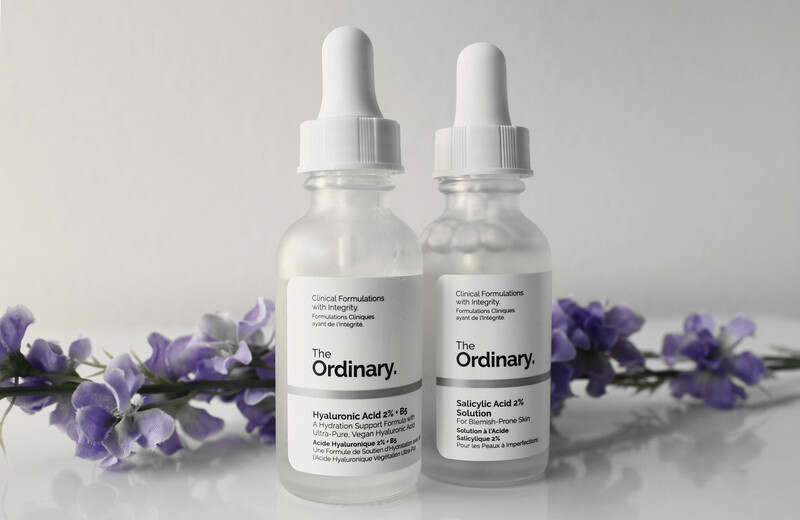 One of the products I was super excited to try was the hyaluronic acid serum because The Ordinary boasts that they’ve developed a clinical strength hydrating formula with ultra-pure, vegan hyaluronic acid. This formulation combines low, medium, and high molecular weight hyaluronic acid, as well as a next-generation H.A. crosspolymer at a combined concentration of two percent for multi-depth hydration. This system is supported with the addition of B5 for enhanced hydration. This past month, the fluctuating weather in LA has definitely made my skin drier than normal, so I’ve been consistently incorporating this serum in to my nighttime skincare routine, and I’ve really noticed the difference! I love how light this formula is – it definitely packs in a lot of moisture without being heavy at all! Plus, I love how affordable it is! Following my love for the hyaluronic acid formula, I also couldn’t help but also purchase the salicylic acid solution from The Ordinary as well! No matter what age, everyone gets the occasional breakout, and I always love having some acne skincare products within arm’s reach. In the past, I’ve always used Clean & Clear’s products, but as I’ve gotten older, I feel that their formulas seem to better catered to a younger customer base, so I decided to pick up a bottle of this salicylic acid solution when I was buying my hyaluronic acid serum, and I’ve loved it so far! 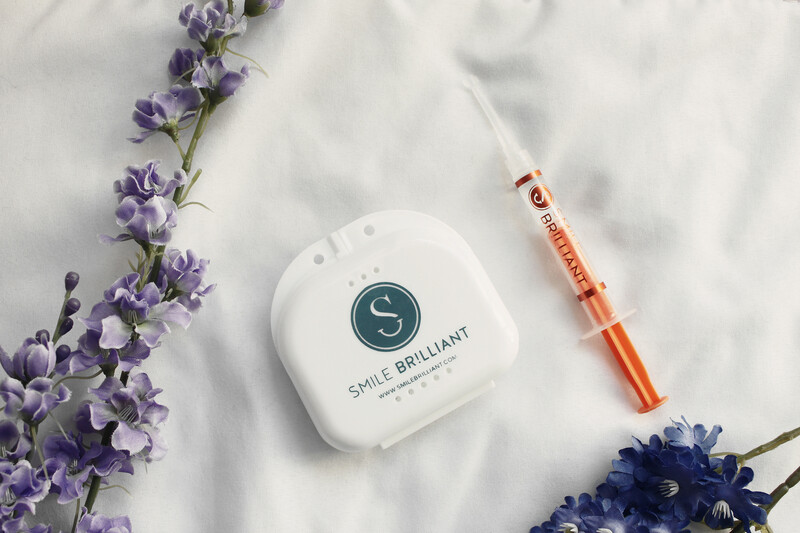 If you’ve been following along on my teeth whitening journey these past two months, then you’ll know that I really loved my Smile Brilliant At-Home Teeth-Whitening Kit! Smile Brilliant sent my everything I needed, including putty mold, the instructions to make my dental impressions, whitening gel, as well as desensitizing gel. All I had to do was make my mold at home and send it back in the pre-paid padded envelop. Once my trays to came back, all I did was apply the whitening gel on the trays before popping them in to my mouth! I whitened every other day for about three weeks, and I left the trays on every time for about 45 minutes.And to be honest, I saw results after the first session already! It was really amazing how fast it worked! For more details about my teeth whitening experience and the chance to win a teeth whitening experience of your own, check out the original blog post! 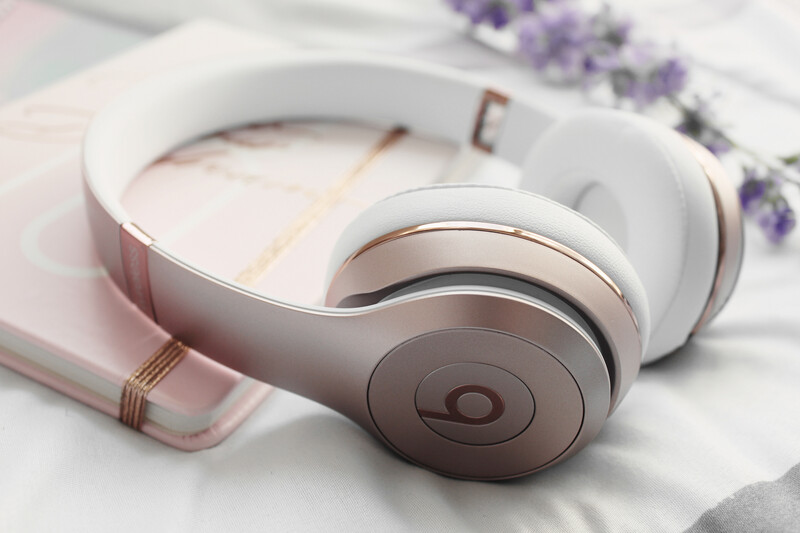 And lastly, I don’t have a book recommendation this month, but I do have a tech favorite, and they’re none other than these rose gold wireless on-ear headphones from Beats! Not only do I love the pretty color so much, I love how comfortable these headphones are! I’ve heard that using earbuds can eventually lead to worse and worse hearing over the years because music is being directly blasted so close to your eardrums, but over-the-ear headphones are a lot better for your ears, since they’re further away! I definitely want to keep my hearing, so I’m going to try using these headphones or listen to my music on speaker more often this year! And if I really have to use earbud-type headphones, I’ll be sure to turn the volume down as low as possible! And that wraps up my favorites for this past February! What were some of your favorites last month? Let me know in the comments because I always love hearing from you all! Love this post, I’ve heard so many great things about Smile Brilliant! Yesss, they’re amazing! 🙂 You should definitely give it a try! Ooh great items babe, I want to check out the ordinary products asap! Yes, they’re amazing! 🙂 ❤ Plus, they're super affordable too! This eyeshadow palette sounds amazing, and I love The Ordinary but I haven’t tried their Hyaluronic Acid serum yet. Obsessed with this eyeshadow palette recently! ❤ 🙂 And ohhh their Hyaluronic Acid is amazing too! Great photos. I LOVE The Ordinary – such a good price point too! Love your favorites! Especially those Too Faced! OK I neeeed to try Fenty Beauty!!! Have heard so many good things!! Yes, it really is worth all of the hype ❤ 🙂 You'll love it! The chocolate bar smells sooo good! ❤ 🙂 And the Ordinary has such cool products! the too faced chocolate bar palette is my absolute fav, been using it non stop for more than a year! Yes, this palette is my favorite! And oh, this whitening kit works wonders! 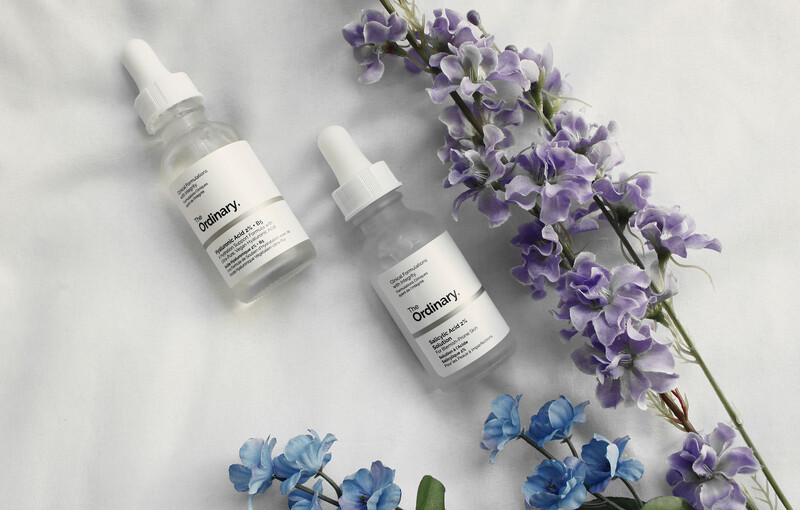 Yes, the packaging of the Fenty products already has me swooning ❤ 🙂 And you should definitely check out the Ordinary, since they're super effective and really affordable too! Time flies very fast. 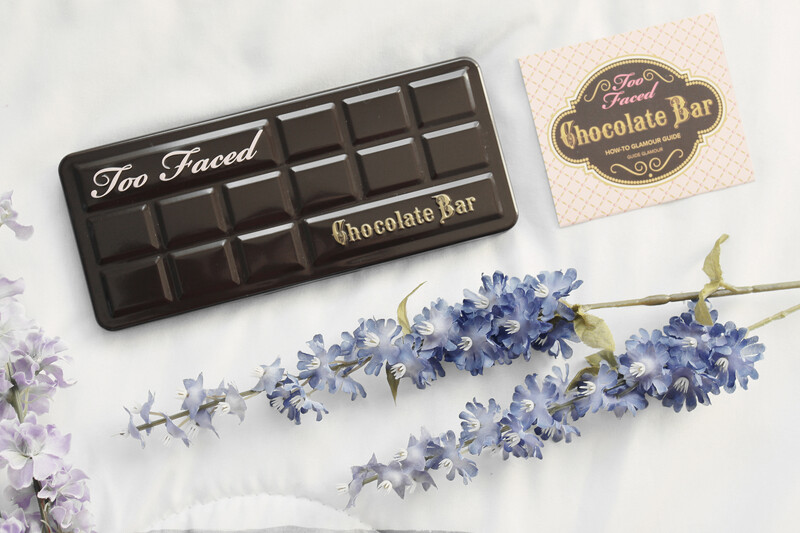 The chocolate packaging of Too Faced looks great. There is something about rose gold gadgets that fascinates me. Ahh, Fenty beauty!! I’ve been eager to try them so badly, but I’ve heard reviews saying it’s not the best for dry skin ao I hesitated a bit. I love your headphones, the colour is indeed really pretty! I have been really curious about The Ordinary and glad to read you had a positive experience!